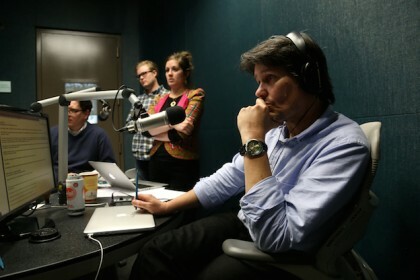 KUT Public Radio in Austin, Texas, is spearheading an ambitious project bringing together public radio stations across the state to tell local, national and international stories from a Texan perspective. Texas Standard is a new daily hourlong newsmagazine produced by KUT in collaboration with KERA in Dallas, Houston Public Media and Texas Public Radio in San Antonio. News organizations such as the nonprofit Texas Tribune website and Texas Monthly magazine are also participating. 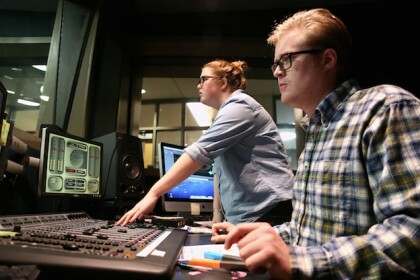 Director Haley Howle, left, and Technical Director Casey Cheek produce an episode of Texas Standard. But when Texas Standard debuts statewide March 2 — Texas Independence Day — Texans will for the first time have a daily public radio news program dedicated to covering stories that matter to Texans, Brown said. “There’s a genuine hunger here in Texas — and not just in Austin but all around Texas — for a program that prioritizes the stories in a way that is consistent with the way that we see the world,” said Brown. But Texas Standard isn’t limited to covering news happening within the Texas border. A Jan. 9 broadcast of the show on KUT’s all-news station featured updates on the hostage crisis in Paris along with Texas-focused stories on the state’s high rate of deaths from child abuse and neglect, and a lawmaker interested in reducing the punishment for marijuana possession. Listeners also heard about topics trending on social media throughout the state. But KUT only recently found room for a new newsmagazine on its airwaves. In 2012, it acquired a second FM frequency that allowed it to split its news and music formats across two stations. Starting last fall, KUT began posting demos of Texas Standard on SoundCloud, and in January the show debuted on KUT as a weekly production. Next month the show ramps up to daily production on KUT, prepping for statewide launch in March. Texas Standard host David Brown listens to a show segment. “We started slowly because we wanted to test capacity both editorially, with the very small staff we started with, but also technically,” Donahue said. Though KUT is taking the lead on producing Texas Standard, collaborations with other public radio stations and media outlets in the state will be key to its success. Vanderwilt described coverage of the recent Ebola incident in Dallas as an example of how that could work. Rick Holter, VP of news at KERA, said that he’s excited about the show because it will give his station’s journalism a broader statewide platform. “This state is so big and so diverse and such a rich well of journalism and stories that something like this makes perfect sense,” he said. Details of the collaborative process are still a work in progress, Holter said. However, a point person at KERA will be in “daily or sometimes hourly contact” with the Texas Standard team. Though KUT is paying for the production of Texas Standard, collaborating stations will make significant contributions of other kinds, according to Vanderwilt. In addition to providing content, they will share studios, making it easy to book guests on the show without needing them to travel to Austin or resort to a phone line. Brown and Donahue were the first staff members to join Texas Standard, starting in June 2013. Donahue had served as news director of KUT’s news station, and Brown was working on Texas Music Matters, which aired on both KUT and KUTX. Since then, the show has added two staff members from KUT News, two from KUTX and three new hires for production jobs. Donahue in a Texas Standard staff meeting. KUT is also building a studio dedicated to Texas Standard. In addition to drawing on existing funds, the station has received grants, and it aims to attract corporate sponsors and seek additional grants for areas of coverage. Brown’s vision is even bigger. Correction: An earlier version of this story referred to KUT 90.5 as KUT News. KUT News is the station’s news department. 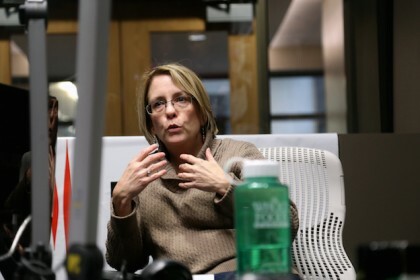 Debbie Hiott, a 26-year veteran of the Austin American-Statesman, signs on with the station Jan. 14. I wish I lived in Texas — I’d be listening to Texas Standard EVERY TIME IT IS BROADCAST. Emily and Dave — you folks have really managed to get practically the entire state’s newsworthy topics covered within the scope of an hour — which is not very easy to do.